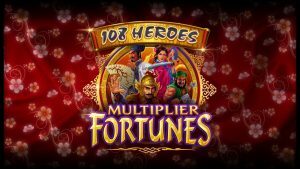 Play Microgaming’s 108 Heroes Multiplier Fortunes and experience high adrenaline wins with the 108 Heroes gang. This new fun-filled game is a fusion of two successful Microgaming pokies, 108 Heroes and Mega Money Multiplier. Take a step into a hero’s world and enjoy some familiar features such as the highly favoured respin feature and the rewarding multipliers. As a player of 108 Heroes Multiplier Fortunes, you’ll experience the classic pokies of 3×3 reels, with Wild symbols and Multipliers that stack on the centre reel for big win respin action. Exactly what the punter ordered. Microgaming are providing a top-quality user experience and this exceptional pokies game can be played on multiple platforms such as your Desktop and Mobile. Welcome bonuses are where it’s at. Many newbies are registering accounts and searching for the best welcome bonus available on the market. Some sites offer a generous Welcome Bonus to get you started, where you could have access to 108 Heroes Multiplier Fortunes combined with hundreds of games to play from the comfort of your own home. Land one, two or three multipliers on a payline and you will be the winner of a nifty prize. The more multipliers you land and the higher the multiplier value, the larger your prize will be. In 108 Heroes Multiplier Fortunes, the Wild Multipliers are Wild symbols and will substitute the Bar and the Seven symbols. When Wild Multipliers land in a winning combination with Bars and Sevens, they will multiply the paytable prize by the multipliers landed. Online casino users are more likely to frequent a particular website when they are confident they will be offered some free spins. You asked, 108 Heroes Multiplier Fortunes delivered. When you land two or more Multipliers on the centre reel during the base game, you will trigger a free respin. During the respin, the centre reel will be locked and only the first and third reels will respin. The amazing thing about the respin feature is that your prizes will be doubled. The respin will work on the bet that triggered the feature. 108 Heroes is visually spot on. The sleek red backdrop resembles silk and adopts an Oriental theme. What will certainly hook the player are the epic respins. There isn’t much to fault about 108 Heroes, and if it’s a little fantasy graphics on top of solid promotions you’re looking for, you’re on to a good thing.